Oxford University Press, USA, 9780195147148, 352pp. In Unbending Gender, Joan Williams takes a hard look at the state of feminism in America. Concerned by what she finds--young women who flatly refuse to identify themselves as feminists and working-class and minority women who feel the movement hasn't addressed the issues that dominate their daily lives--she outlines a new vision of feminism that calls for workplaces focused on the needs of families and, in divorce cases, recognition of the value of family work and its impact on women's earning power. 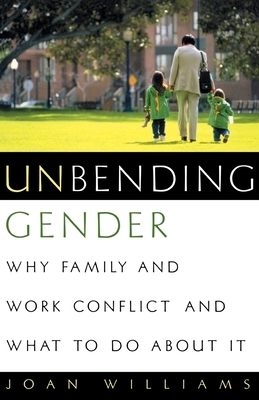 Williams shows that workplaces are designed around men's bodies and life patterns in ways that discriminate against women, and that the work/family system that results is terrible for men, worse for women, and worst of all for children. She proposes a set of practical policies and legal initiatives to reorganize the two realms of work in employment and households--so that men and women can lead healthier and more productive personal and work lives. Williams introduces a new 'reconstructive' feminism that places class, race, and gender conflicts among women at center stage. Her solution is an inclusive, family-friendly feminism that supports both mothers and fathers as caregivers and as workers. Joan Williams is Professor and Director of the Program on Gender, Work and Family at American University Law School. She lives in Washington, D.C.